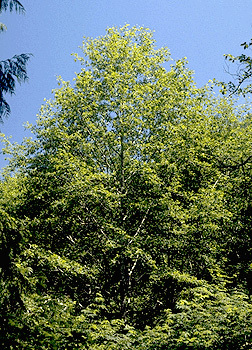 Order: Fagales Family: Betulaceae The Red Alder is a tall tree native to North America, The tree is abundantly found throughout the west coast of North America, The tree produces many seeds that are primarily dispersed through wind. However, the seeds need mineral rich soil to germinate. Areas effected by fires or logging are prime areas for this tree to grow. The tree also has a diverse range of commercial uses including dye, woodworking, and restoration of ravaged lands. There are 239 SSR markers associated with 239 features in this organism.